The chic white Acer H5360 projector transforms the living room into a home theater via native 16:9 HD-ready projection, HDMI connectivity, and brilliant color reproduction. Furthermore, immersive Stereoscopic 3D entertainment is now brought to your home! Immersive 3D visuals for games, movies, photographs beamed from the Acer 3D-ready projector. The compact Acer H5360 projector brings immersive, 3D movies and gaming to the big screen, even in rooms with bright ambient light, like your living room or the classroom. Native 720p (HD-ready) resolution sharpens movie details; true 24p frame rate preserves real film quality for a cinema-like experience; and higher brightness and contrast ratios project crystal-clear images. Wall-color compensation lets you project accurate images even on colored walls, and HDMI connectivity portrays brilliant games and entertainment in the comfort of your living room. Stereoscopic visuals add depth and feeling to games, movies and photographs. The Acer H5360 projector is certified for leading 3D solutions: NVIDIA 3D Vision and DLP 3D. NVIDIA 3D Vision kits transform hundreds of PC games to full stereoscopic 3D. DLP 3D Ready kits with high (120 Hz) refresh rates render a flicker-free 3D experience. The Acer Empowering Technology suite of tools helps you conveniently customize your power, viewing and timer settings via the Empowering Key on the remote control. Instant Resume allows you to instantly turn the projector back on without waiting for it to cool to room temperature. 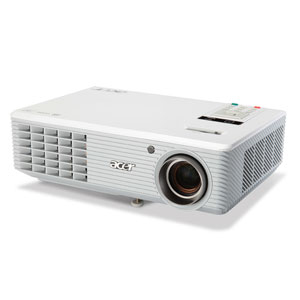 Acer EcoProjection technology cuts standby power consumption from 5 W to 1 W. Summary Product DescriptionAcer H5360 - DLP Projector - 3D ReadyDevice TypeDLP Projector - High Definition 720p3D TechnologyYesDimensions (WxDxH)26.8 cm x 19.2 cm x 8 cmWeight2.2 kgImage Brightness2500 ANSI lumensImage Contrast Ratio3200:1Resolution1280 x 720Native Aspect RatioWidescreenColour SupportUp to 1.07 billion coloursBulb typeP-VIP 200 WattBulb life cycle3000 hour(s) / 4000 hour(s) (economic mode)Video InputRGB, S-Video, composite video, component video ( PAL-B/G, PAL-N, PAL-M, PAL-I, NTSC 4.43, NTSC 3.58, PAL-D, SECAM L, PAL-H, SECAM K1, SECAM D/K, SECAM B/G )Digital Video StandardHigh-Definition Multimedia Interface (HDMI)Video Modes480p, 720p, 1080i, 1080p, 480i, 576i, 576pInput DeviceRemote controlPowerAC 120/230 VPower Consumption Operational224 WattManufacturer Warranty2 years warranty Detail General Device TypeDLP Projector - High Definition 720p3D TechnologyYesWidth26.8 cmDepth19.2 cmHeight8 cmWeight2.2 kgProjector / Panel Image Brightness2500 ANSI lumensImage Brightness (Reduced)2000 ANSI lumensImage Contrast Ratio3200:1Image Size67 cm - 762 cmProjection Distance1 m - 10.3 mDigital Zoom Factor2xResolution1280 x 720 (native) / 1920 x 1080 (resized)Native Aspect RatioWidescreenColour SupportUp to 1.07 billion coloursMax Sync Rate (V x H)120 Hz x 100 kHzBulb typeP-VIP 200 WattBulb life cycle3000 hour(s) / 4000 hour(s) (economic mode)FeaturesColorBoost II+ Technology, Front Project 3D DLP Link technology, NVIDIA 3D Vision, EcoProjection TechnologyProjector Lens System Keystone Correction DirectionVerticalVertical Keystone Correction-40 / +40Video Input Analogue Video FormatPAL-B/G, PAL-N, PAL-M, PAL-I, NTSC 4.43, NTSC 3.58, PAL-D, SECAM L, PAL-H, SECAM K1, SECAM D/K, SECAM B/GAnalogue video SignalRGB, S-Video, composite video, component videoDigital Video StandardHigh-Definition Multimedia Interface (HDMI)Video Modes480p, 720p, 1080i, 1080p, 480i, 576i, 576pInput Device TypeRemote control - external - wirelessMovement Detection TechnologyInfraredExpansion / Connectivity Interfaces1 x composite video input - RCA , 1 x component video / RGB input - 15 pin HD D-Sub (HD-15) , 1 x S-video input - 4 PIN mini-DIN , 3 x component video input - RCA , 1 x HDMI - 19 pin HDMI Type A , 1 x audio line-in - mini-phone stereo 3.5 mm , 1 x serial RS-232Miscellaneous Included AccessoriesCarrying case, lens coverCables Included1 x VGA cable , 1 x composite cablePower Power DevicePower supply - internalVoltage RequiredAC 120/230 VPower Consumption Operational224 WattPower Consumption Operational ( Standby )1 WattManufacturer Warranty Service & Support2 years warrantyService & Support DetailsLimited warranty - 2 years - carry-in , Limited warranty - lamp - 1 yearEnvironmental Parameters Sound Emission32 dBASound Emission (Economic Mode)27 dBA Find similarNot quite found what you are looking for? You can find products which may be more suitable by simply checking the features that interest you and clicking the find button.